07 | February | 2010 | Through the seasons before us.. I missed Mark Arthur’s interview on Radio Nottingham before the match, but caught Billy at the end. Apparently the gist of Mark Arthur’s comments were the very familiar soundbites around not being held to ransom on signings – and apparently that we only had three serious targets (Shorey, Moses and Pratley with a side-order of Bale until Tottenham’s injury situation). A similar situation to previous January windows I suppose – and in a way I admire the club for not being ripped off as many teams are in these situations, and indeed, sticking to their policy of improving the squad rather than making knee-jerk signings. I’m very surprised that Shorey was our only lead at left-back as it became increasingly apparent that Gareth Bale was increasingly featuring in Harry Redknapp’s plans. 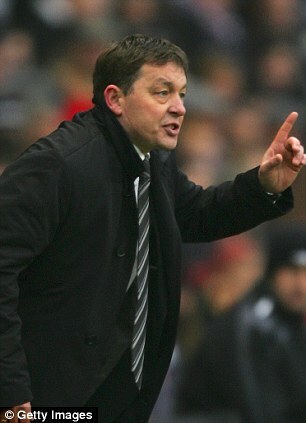 Now fast-forward to post-match and Billy Davies doesn’t quite sing from the same hymn sheet. I will start by saying one very important thing – everything that Billy says to the media is to be taken with a massive pinch of salt (and I think he wouldn’t mind me saying that too). That’s not to say I don’t believe him – just that he plays the media quite cunningly, and it wasn’t surprising to hear him not exactly following the lead of the chief executive. The second thing to say about Billy’s interview was that he didn’t sound like he was agitating to me, just an honest appraisal of the situation. He started with Majewski, who he claims he withdrew to the bench because his head wasn’t in the right place because of uncertainty over his future – he intimated he wasn’t aware of the state of negotiations to make his move to the City Ground permanent – something Billy said both he and the player wanted. I couldn’t help but think back to ‘Oh, Wes Morgan/Guy Moussi is injured and a doubt for x game‘ type comments we’ve seen from Billy only to find the player not only starting the game – but clearly at a high level of fitness and not injury doubts at all. Billy likes to play little games like this, and perhaps this is another one – at least I hope so, not to take today’s result away from them, but we missed Raddy’s vision in midfield today. His second comment was around the left-back situation – it’s clear to everyone (aside from the usual idiots in the stands) that Perchy is in an uncomfortable position, covering left-back. It will become apparent to our opponents too. Billy sounded frustrated, and interestingly said Cohen himself was resistant to being pushed back there (which I can understand, as he’s becoming very effective in midfield). Now, on the face of it there’s lots of cause for concern here. A star player unsettled – a difference in story between the board and the manager, but I think if you look through the obvious then this is probably reasonably quite calculated. Certainly the club will clearly be disappointed with their January business, as we were last season, and they’ll know the fans are too. Personally I think that Mark Arthur – every message board’s favourite pantomime villain – is taking a hit for the club, giving Billy the opportunity to rally the fans behind him as the sorely-put-upon manager, with a threadbare squad. Which is a reasonable position for him – he gave the panel targets, they weren’t acquired – so that’s Billy’s side of the bargain met. However – I do think some sense of proportion is required. We certainly do lack a left-back (and a left-winger in my opinion), but we are where we are in the league on merit, and the loan window opens soon – so it’s not exactly wrist-slitting territory just yet, which some phone-ins or internet forums might suggest. Perhaps being incommunicado as the window closed has helped me retain perspective. I don’t think that things are quite as up in the air as Forest are making it try to appear though.